The Large Hadron Collider is a beacon of all that's great about science and engineering—but that doesn't mean it always works properly. In fact, the facility is so sensitive that even the moon's gravitational pull affects how well it operates. Over at Quantum Diaries, the LHC's Pauline Gagnon explains that the changing gravitational forces exerted by the moon—which are what drives the tides—cause tiny shifts in the position of hardware within the collider. 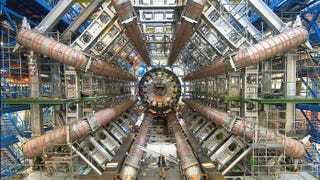 Because the LHC has a circumference of nearly 27km, those small shifts are amplified, which means that the incredibly sensitive device is thrown off track, and the proton beams begin to miss each other.